Stock market news junkies like me spend a lot of time keeping an eye on the financial markets. Over the course of a given year I probably spend 1,000 hours either watching CNBC at my desk or listening to CNBC in my car on SiriusXM. The business channel’s anchors and other regulars are an expected, familiar part of my work day. 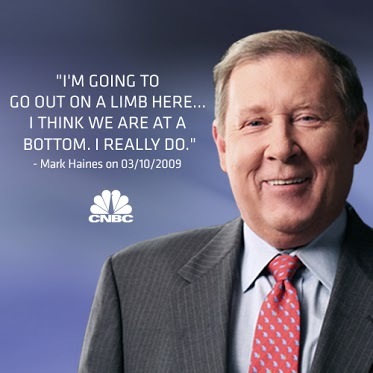 It was two years ago today that Mark Haines, a CNBC morning anchor and fixture on that network for 22 years, suddenly passed away as a result of a heart attack – “Squawk on the Street” has not been the same since. To this day l miss Mark’s caustic wit, refusal to accept B.S. answers from guests and special rapport with co-anchor Erin Burnett. Mark is widely remembered among the investment community for many reasons, but one of his more notable claims to fame is a prescient stock market call. On March 10, 2009 Mark called the 2007-2009 bear market low to the day. You can watch the CNBC segment by clicking here. Since the “Haines Bottom” four years ago the Dow is up 120.8%, the S&P 500 has increased 129.4% and the Nasdaq has tacked on 154.7%.